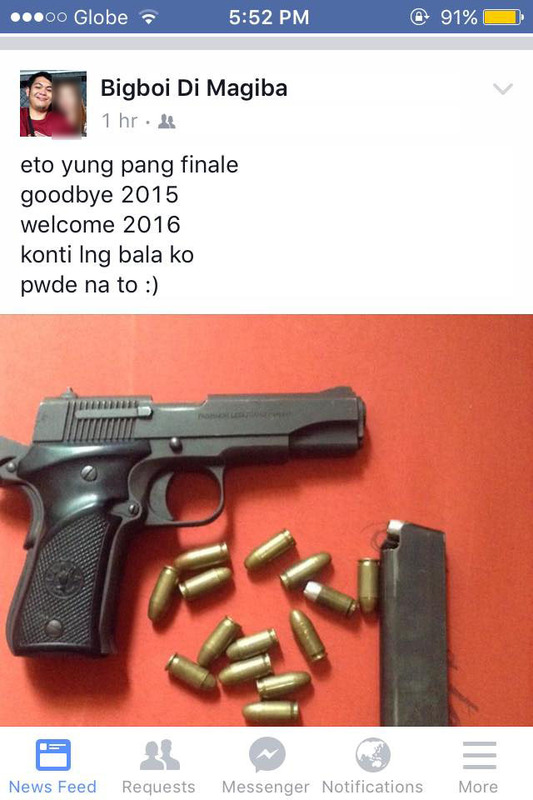 At a time when the police is asking gun owners to refrain from indiscriminate firing of their guns, a netizen from an unknown location posted a photo of his pistol with a handful of bullets suggesting he will be firing his gun to greet year 2016! The netizen is hiding from the username Bigboi Di Magiba and upon investigation, the guy’s real name is Jaypee Clemente. As of this writing, a netizen asked him not to push through with his plan to fire his gun. While one netizen informed the gun owner, he is now trending on Facebook. Generally speaking, netizens reacted strongly against the post of the netizen and some are now calling the attention of the PNP to trace the whereabouts of the gun owner with irresponsible tendencies. Whether he is bluffing or not, that we don’t know yet. Sure, there are other ways to celebrate the New Year and firing a gun is not of them. Check out the video below for a fun idea to welcome 2016. Sino ang nakasubok nito sa probinsya? Hahaha. Sino ang nakasubok nito sa probinsya? DOE halts oil exploration in the Spratly; is this a sign of weakness or strength?